Laura Eve Engel's work has recently appeared or is forthcoming in Black Warrior Review, Boston Review, Crazyhorse, The Southern Review, Tin House and elsewhere. 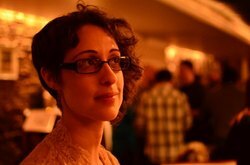 She was the 2011-2012 Jay C. and Ruth Halls Poetry Fellow at the Wisconsin Institute for Creative Writing. She tweets stuff @lauraeveengel.